There are myths relating to this constellation as far back as the ancient Babylonians, Egyptians, Persians and Greeks. In one variation of the Greek myth, Phrixus and Helle were the son and daughter of King Athamas, son of the god of the wind and the cloud goddess Nephele. It was Nephele's custom to disappear during the hot summer months. After many years of this, Nephele did not come back. Eventually, Athamas took a new wife, Ino, who was the daughter of the King of Thebes. They had two more children, but Ino grew jealous of the two older children. she decided to stab them to death in their sleep one night. In the morning, to her horror, she discovered that she had killed her own children. To save Phrixus and Helle, Nephele sent a supernatural ram with a golden fleece to fly them from Greece north towards the Black Sea. The brother and sister clung to his back as he flew them across the water. When they reached the straits connecting the Aegean Sea to the Sea of Marmara, Helle was unable to hold on any longer. She fell into the sea and was drowned. 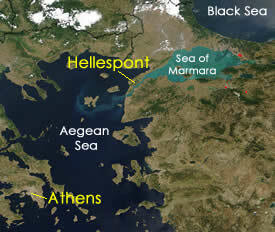 The Greeks named that spot Hellespont in her honor. Today it is called the Dardanelles. Phrixus was carried safely to the other shore to a place called Colchis. Once there, the golden ram declared that his work was done and that Phrixus should sacrifice him to Zeus and remove his golden fleece. Zeus put the brave and generous ram in the sky as the constellation Aries. It does not shine very brightly because it no longer has its golden fleece. Phrixus presented the fleece to Aeetus, King of Colchis. He hung it in the sacred Grove of Ares, where it was guarded by a dragon who never slept. It was said to be so brilliant that it bathed the surrounding countryside in golden light and had the power to restore life to the dead. Later, Jason and the Argonauts would steal it and return it to Thessaly. The energy of Aries is strong and courageous. As the first sign of the zodiac, it is associated with fresh new beginnings. It's not too great at finishing anything, though. When planets move through the sign of Aries, they infuse us with boundless energy that we use to dash impulsively from one new project to another. 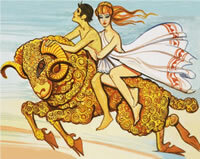 Aries stirs up a sense of passionate adventure in us. The type of adventure we're after depends on the nature of the planet that is traveling through it, but no matter what it is, we chase it with confidence and gusto. Turning ideas into action is what Aries is all about. Too much of this energy can generate feelings of aggression, even violence. Too much Aries energy can also make us feel arrogant, boastful, egotistical, and intolerant. It is difficult to hold the Aries energy back. 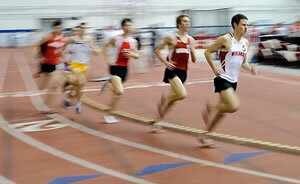 It is a time of champing at the bit while we have to wait for what we want. You can accomplish a great deal during these transits if you use your Aries energy wisely. The ecliptic is the earth's path around the Sun. The celestial equator is an imaginary extension of earth's equator projected out into space. Each year, on about March 21st, the Sun is directly over earth's equator a the point where the ecliptic crosses the celestial equator. This point is known as the Spring or Vernal Equinox. During ancient times, this point coincided with the beginning of the constellation of Aries. Thus, it became known as the First Point of Aries. The First Point of Aries is still used in calculating the Right Ascension position of celestial bodies. Right Ascension is the celestial equivalent of longitude. Due to the fact that the earth takes slightly more than 365 days to complete its orbit around the Sun, the point where the ecliptic and the celestial equator cross slides backwards a bit each year. This is known as precession. It will take roughly 23,000 years for the earth to once again cross the celestial equator at the original First Point of Aries. The Vernal Equinox currently occurs in the constellation of Pisces. Aries, nonetheless, is still considered the symbolic first constellation of the Zodiac. Aries is the Latin word for Ram. 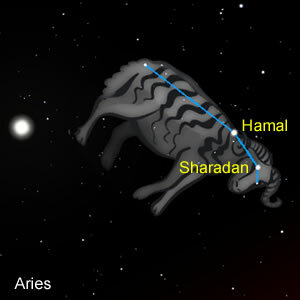 The brightest star in the constellation, Hamal, translates from the Arabic to "the lamb" and points to the head of the sheep. The second brightest star, Sharatan, marks the second horn. Aries lies between Pisces to the west and the Big Dipper to the east. It can be seen from October to February.